> 2017 BACK ON STAGE, AFTER A BREAK OF 14 YEARS !! AFTER A BREAK OF 14 YEARS !!! The THEO JÖRGENSMANN QUARTET is a top-class German Jazz Quartet. Their CDs "Snijbloemen" (hatOLOGY 539) and "To Ornette - Hybrid Identity" (hatOLOGY 576), have been enthusiastically reviewed by many critics worldwide. "Snijbloemen" was awarded four stars in the July 2000 issue of the renowned American magazine Downbeat and "To Ornette - Hybrid Identity" (hatOLOGY 576) was awarded 5 stars in the German magazine FONOFORUM and in allaboutjazz/italia. 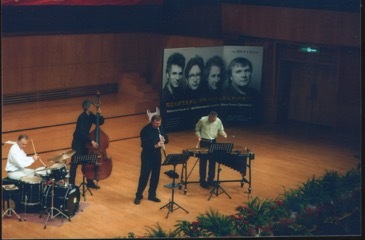 In 1999, 2001 and 2003 the quartet played three USA/Canada tours sponsered by the German Government of the Federal State North-Rhine Westphalia (NRW). They performed on festivals such as Open Ohr Festival Mainz 1997, Solo Virtuos Gelsenkirchen 1998, Jazz Night Lüneburg 1998, Klap Op De Vuurpejl Amsterdam 1998, Paranoia Festival Tilburg 1998, Jazz Podium Ruhr 1998, Jazz Festival Münster 1999, Rheinisches Musikfest 1999, Du Maurier International Jazz Festival Vancouver 1999, Festival International De Jazz De Montreal 1999, Festival Musik In Den Haeusern Der Stadt Koeln 1999, Duisburger Akzente 2000, Jazz Festival Varna 2000, European Echoes Leverkusen 2002, Jazz Festival Würzburg 2002, Jazz Festival Nanjing 2002 (& Tour in China), Intl Jazz Festival Vancouver 2003, Intl Jazz Festival Edmonton 2003, Intl Jazz Festival Montréal 2003, Intl Music Festival San Francisco 2003 (& Tour in USA/CA), Westfälisches Musikfest 2003, Jazz Festival Greiz 2003. With this formation, Jörgensmann, who did much for the Renaissance of the clarinet in the 80.s, captivates with a music that has soul, and that "pursues an unusual and polished chamber music equilibrium. He [Jörgensmann] has a sound with high specific gravity". One can easily get excited about a music that, in spite of "soul" does not simply "disregard" reason, but rather retains a "floating balance between control and feeling ".